I had a bunch of coriander in the fridge, and no plans for it, so making coriander pesto seemed like a sensible thing to do. So out came the mini processor, the coriander was rinsed and chopped, along with a couple of cloves of garlic, and the pantry was raided for nuts and olive oil. Having such a small kitchen now, I no longer have as many pantry items on hand as I used to, and nuts were lacking. I used to keep a variety of nuts on hand, but that’s not the case now. In fact the only vaguely suitable nuts were the remains of a packet of unsalted mixed nuts that Steve had bought by accident, so they went into the mix. The coriander went in first with some olive oil, and it was processed until it was roughly chopped, then I added the garlic, nuts and a little more oil and blended it until it was a suitable consistency. The flavour was more peanuty than you might want in a pesto, but overall it was fine. The next question was what to do with it? 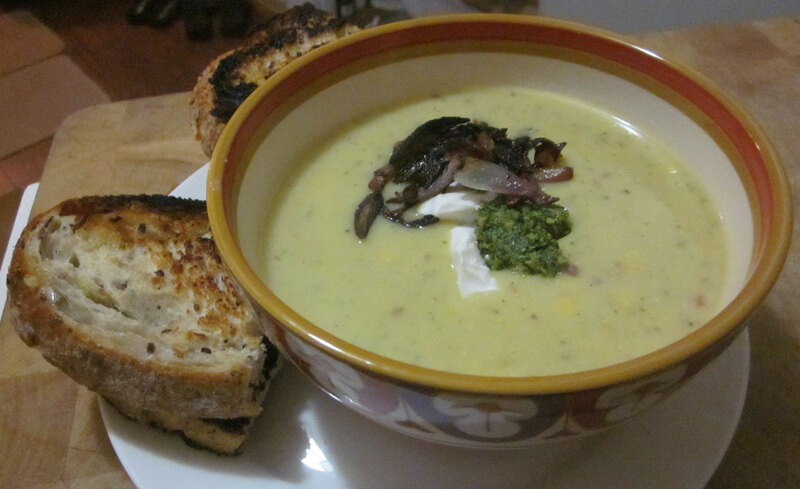 Before we moved, at this time of year soups would have been a regular on the menu. I’d make a big batch on the weekend and we’d use it for lunches and quick dinners through the week. Where we now though, it hasn’t really been cold enough yet. However yesterday was officially the first day of winter here, so I decided to ignore the fact that we’re still wearing t-shirts and honour it by making Corn Chowder with a Mexican twist. This is a bit of a mish-mash of various recipes I’ve seen, plus my own additions. 3-4 tbsp coriander pesto, plus extra to serve. First chop up all the veggies. I don’t worry about making the pieces too small since it all gets blended later anyway. Heat a large pot with some olive oil and add the onion, garlic, carrot, celery and chilli (if using) and fry until the onion softens. Then reduce the heat to low, add the flour and stir it through. Next add the potato and yellow split peas, followed by the veggie stock and soy milk. Turn up the heat and bring it to the boil. Once it’s boiling, add 2 cups of the corn kernels and reduce to a simmer until everything is cooked. Let is cool and then blend. I use a stick blender for this. Then reheat gently, adding the coriander pesto (or fresh chopped coriander) and the remaining cup and a half of corn kernels. Just before serving stir though the lime juice. Serve topped with a large dollop of Tofutti Sour Supreme, coriander pesto and fried red onion. I also went for some fried bread (which I haven’t had for years) on the side – not very healthy I know, but so yummy!